Early development of cells and organisms involves changes in DNA methylation, as well as conservation of certain types of DNA methylation. Since DNA methylation is an integral part of epigenetic inheritance, this provides evidence for the role of epigenetics in genome programming as well as reprogramming. The actual DNA sequence, or genome, is programmed during development to express certain genes at appropriate times. This programming is accomplished through epigenetic influences on the genome (Szyf, 29). Epigenetic influences cover a broad range of mechanisms, but they are essentially any type of cell control or memory that does not involve the actual DNA sequence. Much research has been spent recently on stem cells and the reprogramming of somatic (body) cells. These processes involve reprogramming a cell back to its original embryonic state, or a place where it can form many different types of cells, not just a copy of a specific cell type. For example, a liver cell would be reprogrammed back to its embryonic state, so that it could become a whole new organism, rather than just producing more liver cells. In essence this is the same kind of technology used in cloning experiments. Many scientists feel that the low efficiency of cloning experiments is a result of epigenetic factors . 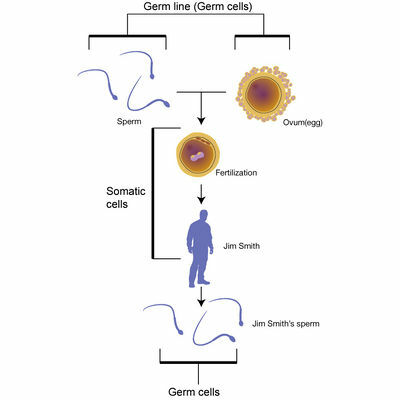 In a cloning experiment, the egg cell itself has to reprogram the DNA that is inserted into it from another cell during the cloning process, and this depends on epigenetic mechanisms (White, 43). In this way, some scientists have come to look at the cell itself as the provider of stasis for an organism, because it passes on its contents (everything but the DNA) unchanged from one generation to the next (Williams, 29). Szyf, Moshe. The epigenetic impact of early life adversity. Canada: McGill University, 2009. Web. Feb 27 2010. White, David. The genetic puppeteer. Technical Journal 30 (2008): 42-44. Web. Feb 20 2010. Williams, Alex. “Inheritance of biological information—part I: The nature of inheritance and of information.” TJ 19 (2005): 29-35. This page was last modified on 17 October 2015, at 19:10.